My recent article for CreativePro.com, Illustrator WOW! Techniques: Flexible Shading and Highlighting Effects, is now posted on their website. It expands on the coloring process using the Adobe Illustrator vector art Shapebuilder tool described in my Gallery page in the Illustrator WOW! CS6 book. 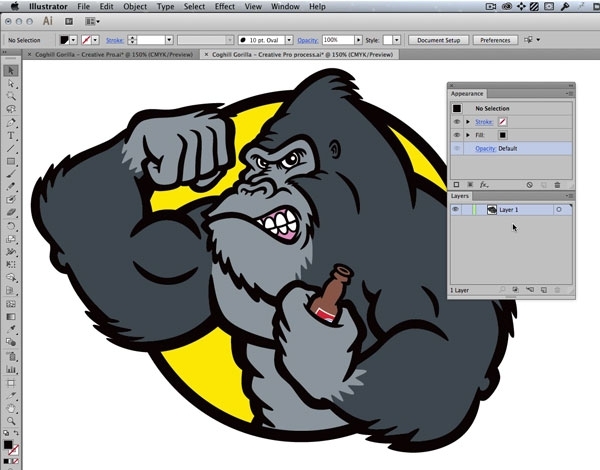 I just posted this screencast video on YouTube where I critique vector art created by a beginner Adobe Illustrator user. These critiques apply to any vector art software. Just saw this over at design blog BittBox: when drawing with the Shape tools in Illustrator (rectangle, circle etc. ), holding the tilde key (the squiggle key to the left of the 1 key on U.S. keyboards) and then dragging the mouse will result in lots of duplicates of the shape following the trail of your mouse pointer. A great quick tip, from the excellent design blog BittBox, to create a color group of all the colors in an Illustrator document: Select all the art in your document, go to the Swatches fly-out menu and choose “New color group” – you now have a color group folder of all the colors in the artwork. Very cool! Since color groups are a CS3 feature, this tip is Illustrator CS3 only. A cartoon illustration & design project for a friend’s party required the resulting art to be suitable for reproduction on a photocopy machine. 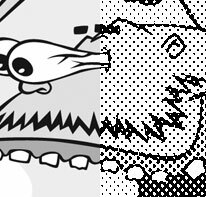 After some trial, error, Google search, trial, error, Google search, trial, error I discovered the magic combo that allows you to create a halftone in Photoshop for an image and print it out on your inkjet printer so the art will be perfect for photocopying. This technique is perfect for flyers, newsletters or any other short-run printing needs you have where the cheapness of a photocopy is desired, but so are grayscale images.